We had plans to set up home in Australia and we wanted to see the world by bike, so we decided to cycle from the UK to New Zealand, raise money for charity and explore rugby across the world into the bargain. When we set off in May 2010 we had just one contact, in the Czech Republic. But the rugby family opened up to us and by the time we got to New Zealand we’d had loads of people getting in touch to say we could stay with them. It’s amazing how big grass-roots rugby is across the world. We’ve stayed with guys who are part of rugby projects all across Europe and Asia. We arrived in New Zealand a week before the World Cup, flying in from Australia, then set off to cycle to Eden Park from Dunedin. The trip started in the rain and took in lots of hills so it took a big effort to keep going after so many months on the bikes. 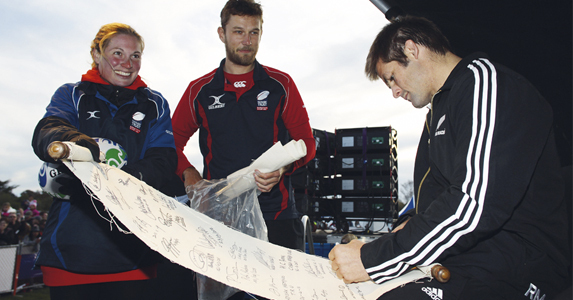 On the way we met Richie McCaw in Christchurch and the Russian team in Blenheim. We went up to Wellington to see Australia v USA and at Palmerston North we presented the Museum of Rugby with our scroll, which has been signed by rugby people from all over the world. That’s going to stay there for ten years, which is amazing. We made it to Eden Park the day before the quarter-finals and a Kiwi gave us tickets to two games. There was a bit of disappointment when England were knocked out, but it didn’t detract from the tournament for us. And that’s the sign of a good World Cup. We watched 12 countries play and we feel like we absorbed what the whole World Cup is about. People talk about cutting the number of World Cup sides, but it’s imperative that we don’t lose the colour of the pool stages. The moment you start thinking about how much money you can make from a World Cup, you lose interest in the World Cup itself. We want to make 50 million more people fall in love with the sport on the back of the World Cup. The highlight of our journey was meeting New Zealand Prime Minister John Key at Ponsonby RFC, where they had put up a display of our trip. Now that we’ve made so many contacts around the world, we want to build a global network, buddy up clubs so they can share their expertise. We want to work on developing rugby from the bottom up rather than the top down and anyone interested should contact us via cyclingtotherugbyworldcup.com. It’s been a great journey and we’ve met some amazing people. But we’re hoping this is just the beginning.